Probably like many of you, the post-Christmas season felt like I was constantly navigating the maze of Amazon boxes, finding bits of ripped wrapping paper in strange places, and trying to find places for all the new stuff we received. Especially after months of feeling constantly behind in housework, having visitors, trying to find new rhythms with three kids, I was feeling one word: overwhelmed. Well, two words: overwhelmed and stressed. One of my number one stressors is clutter. When I feel like I can’t keep up with the stuff and the house always feels messy, it often leaves me feeling like I just want to sit and say “whatevs”—I’ll just live like this forever because it’s easier than managing it. Have you been there? Thankfully, I know that a little time, intentionality, and encouragement can help me get up and get going. The closets have been cleaned up a bit, the broken and unused toys purged, the art supplies organized and cleaned out (anyone else wonder how so many markers lose their caps? ), and random kitchen dishes donated. But, the other day I had to face one of the most challenging areas for me to declutter: kid’s books. I don’t love the books scattered all over the floor, but I do love books for the kids. So what’s a girl to do? I wanted to share some of top “keeps” that will probably always make the cut—these are books that I would gladly gift or recommend. You can see some other books that we’ve loved purchasing or picking up at the library here. We’ll start with books that we still love looking through and are lovely reference books. Even after owning them for a while, we always spot new things and learn something interesting every time we read them. Next up, are the oldies but goodies. I love vintage/tried and true books, but these are the ones the boys still love to read (and I love them too). In fact, Duck is a book I remember reading as a little child! These are a just a few of our favorites that I thought I’d share just in case you want to add a new book to your library list or your own home library. Tell me: what are your family’s favorite books? Ps. Affiliate links are included in this post. If you want to know more about them, check out my affiliate disclosure. As Easter nears, I'm on the hunt for quality stories that help bring the gospel story to life. Recently, I saw someone share the book The Garden, The Curtain, The Cross*, and I ordered it right away. I don't buy too many books (thanks to the library! ), but I thought this one would make a lovely addition to our ever-growing library. 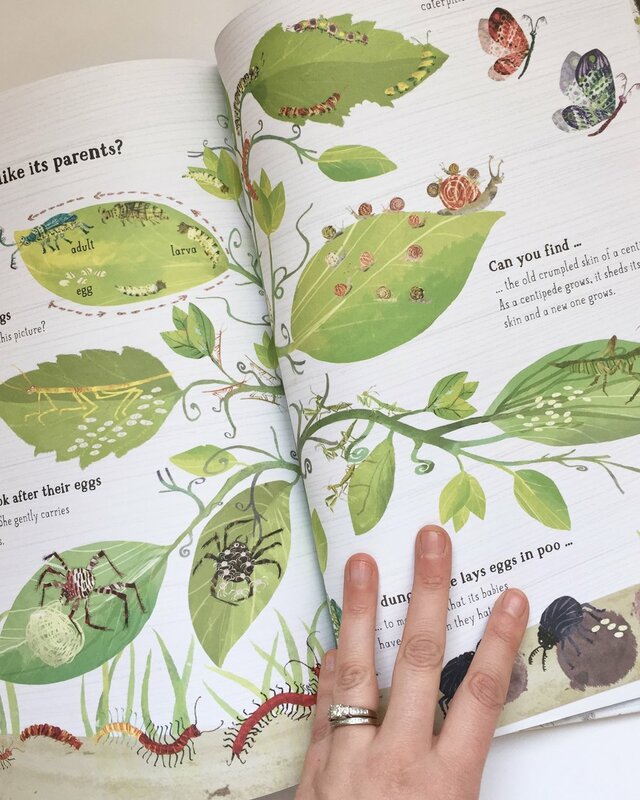 When we got it, I fell in love with the illustrations (because Catalina Echeverri is such a wonderful illustrator!). I also loved the depth, and the fresh perspective, of the story. Even now, it's not often that I think about that huge curtain that loomed in the temple--a very literal separation of God and His people. For kiddos (and adults too! ), the symbolism of the curtain tearing is a strong visual for understanding how Jesus' death and resurrection allows us access to God. Sin separated us from God, BUT Jesus died on the cross and took our sin so that we can be with God again. And that's really the most important thing, right? Do you have any favorite books for Easter? ps. 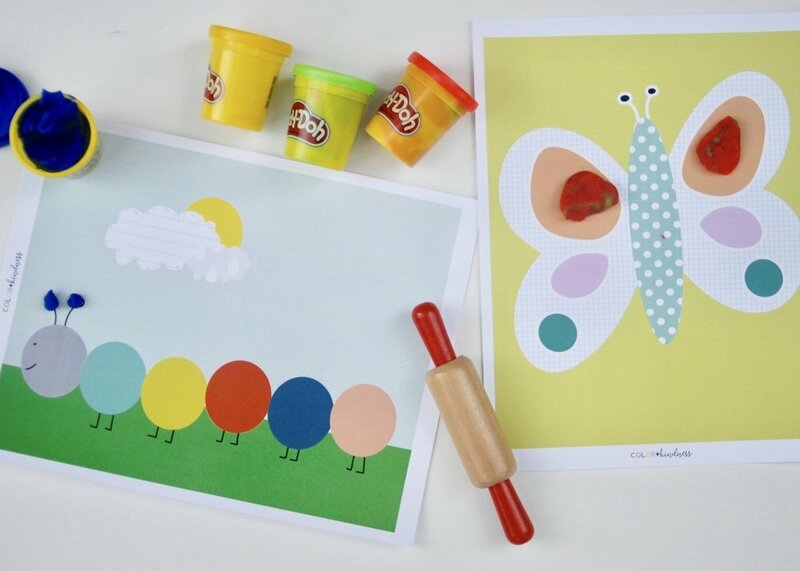 Don't forget to download some free Easter prints + coloring pages to enjoy as we near Easter. *Affiliate links were used in this post. Learn more about that here. It's not quite spring here, but I am getting glimpses of it--the cold isn't so frigid, the birds are singing a bit more, and the snow is melting (for now) into mushy puddles. As the first day of spring approaches, I'm making a list of all the activities we can do and make once it gets a tad warmer: start seedlings for the garden, make little bird feeders, make mud pies, and take walks to the park. Since I have spring on my mind, when we went to the library last week, I picked up the sweetest little book that reminds me of spring. I had read the book before, so I was excited to bring it home and reread it again with the boys. 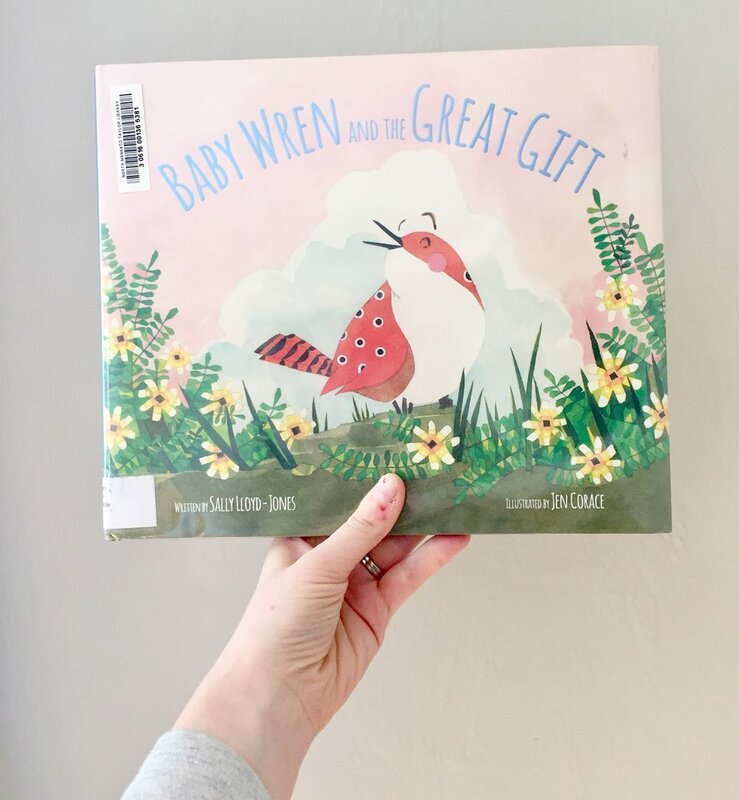 Baby Wren and the Great Gift* is a book by Sally Loyd-Jones about a little bird who is searching for her gift/place in the world. Finally, after meeting many other animals, she learns what her gift is. The writing is lyrical and has repeated verses (which helps build the story for kids) and the illustrations are so lovely and beautiful. This book is wonderful for talking about how God has made everyone (and everything) unique and with a purpose. You can download and print this cute little DIY bird feeder instructions if you'd like to make your own. Once I can hunt down a pinecone, we'll be making some for our little birdies too. Here in Minnesota, we are smack dab in the middle of winter. Although many parts of winter are draining (like zipping up winter jackets over and over, squishing little feet into boots, spending 25 minutes looking for a lost mitten, and days of grey skies), I do love that winter affords me the excuse to stay home a little more and get cozy. One winter rhythm we have is daily snuggle and reading time on the couch. 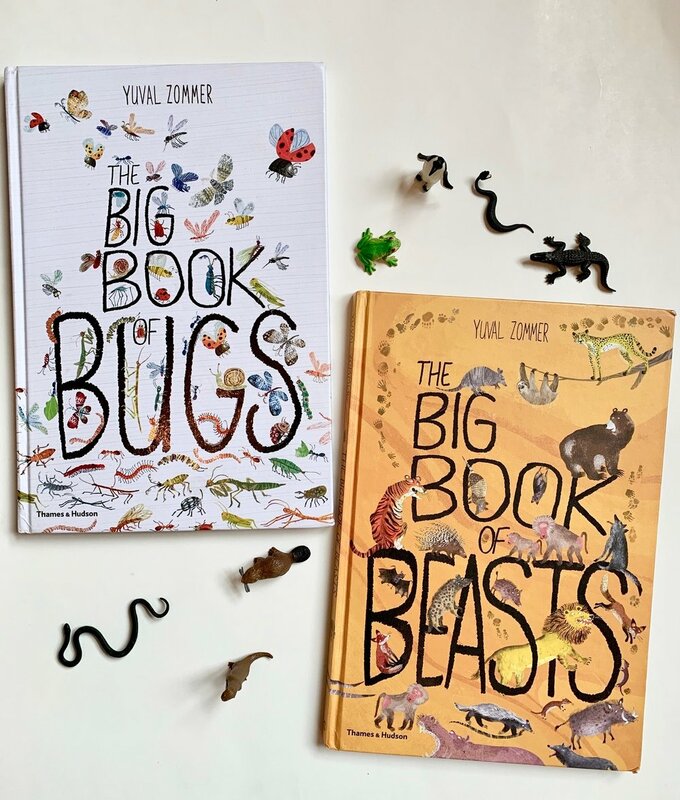 We often find ourselves there after afternoon naps and snacks -- or maybe after I've called in the troops when the noise level enters into crazy-loud territory ;) We gather under the warm blankets and the boys grab some of their favorite books. I also love to use this book as a conversation starter for talking about the intricate and amazing ways that God put together nature. I find myself often saying "Wow! God made that bug super cool!" Even though we've looked through and read this book over and over, something surprises me or reminds me of God's character every time we flip it open.